In Sprint 59, we implemented the Earbits artist email campaign. Other items addressed during this sprint include implementing levels for users and getting the prestiging backend infrastructure in place. We also got around to working on automatic slide-out for the Socialfeed sidebar feature, updating the XP icon, configured the third-party API allowing the display of YouTube images in Socialfeed link cards, and started rolling out the Daily Goals Dashboard. Users can now access this feature through the navigation bar. The XP Icon underwent a rebranding and is now a Levels Badge starting at 0 as a placeholder. As users watch, like, share, and interact with the platform they will move up to different levels. 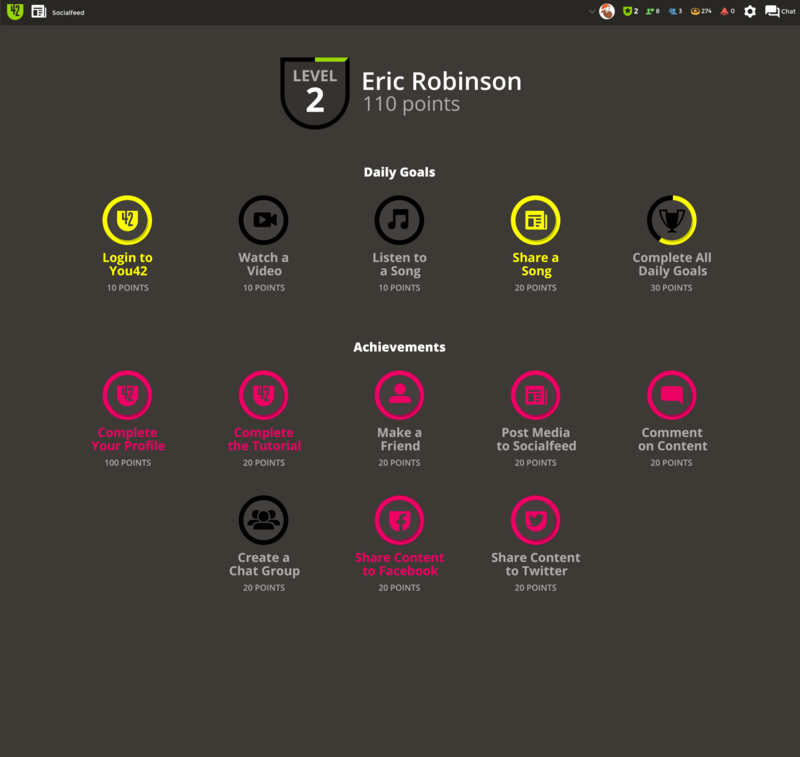 The Daily Goals reflects random updates at different intervals. The styling needs updating to match the UI references. Users can reach this achievement once they’ve managed to obtain a Level Badge ranking of at least 20. Users can view the amount they spend on advertising tokens within the Adverts Section of their profile. They’re also able to generate their own ad reports to reference. The team got the foundations of token services set up within our internal and external QA environments and will likely begin testing in those areas. Our smart contracts now feature a burn function, though it’s still a work in progress. We’ve added the MetaMask plugin to this section with your wallet address. The entire process will be shown within You42. We’ve also come up with an alternative process in MetaMask that displays manual payment instructions if MetaMask isn’t installed. The entire feature will be integrated into the next sprint. What will happen to any current Credit balances held by users once we go live? Will all credits be automatically zeroed out? Right now users receive credits when they start using the application. Users received 100 free credits when they zero out their accounts thanks to a system upgrade implemented last year. It’s currently turned off, but we may revisit this feature for configuration. Right now users can tip up to 1,000 credits for each transaction. We’ll likely make changes to this allotment. Single users are limited to tipping a maximum of 2,000 credits. Restrictions prevent any user from making more than one tip during a 24-hour period. They can also only receive up to 10,000 credits during that time. The system initiates an overlay message when this happens. This feature doesn’t appear to be functioning within Profiles. The team needs to accommodate users by coming up with a short-term solution. Content for reported users should be added to a counter or ticker. A notification should be triggered to administrators once that counter exceeds a set number. Admins should then remove all content, profiles, and related information for that user. The banned user or content owner also receives a notification about the actions taken. We’ll continue our work on the Mobile UI design and the Redemption process. © 2018 You42 Inc. All Rights Reserved.